First Supper | Cross America, Inc.
What is the First Supper? The night before Jesus was arrested, the twelve disciples were all eating an evening meal with Jesus in the Upper Room (Matthew 26:17-30). 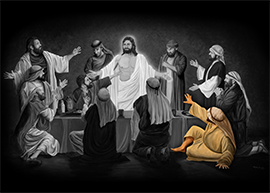 This was known as the Last Supper, symbolizing the last time that Jesus and the disciples would share supper together before Jesus was crucified. They promised to stand by Him no matter what happened. Sadly, within just 24 hours, Judas handed Jesus over to the Roman soldiers for 30 pieces of silver (Mark 14:43-45), Peter denied knowing Him three different times (Luke 22:54-63), and all the disciples deserted Him by running away when He was arrested (Mark 14:50). They were afraid that the Roman soldiers might come after them for being associated with Jesus. Now, fast forward to the point in time after Jesus was crucified. The disciples were eating supper in the Upper Room behind locked doors out of fear. Suddenly, Jesus appeared to them. Their fear turned to amazement as they realized Jesus was alive! The disciples ate a meal with Him (Luke 24:36-43). This was known as the First Supper, symbolizing the first time that Jesus and the disciples would share supper together after Jesus rose from the dead. Jesus appeared to the disciples and to more than 500 people over the next 40 days (1 Corinthians 15:-4-6). The last thing Jesus said to them before He ascended into Heaven was to go into all the world and preach the Good News to everyone (Mark 16:15). That is exactly what they all did. They left their old lives and spread the Gospel to distant countries. The First Supper was the turning point. It turned fear into a passionate devotion, but it came with a high price. They were beaten, imprisoned, and martyred in very painful and torturous ways for preaching the Good News of Jesus. Click below on each disciple's name to learn their stories. After the resurrection of Jesus, some of the other disciples told Thomas that Jesus indeed had risen from the dead, but Thomas did not believe them. The Bible states in John 20:25 that Thomas said, "Unless I see the nail marks in His hands and put my finger where the nails were, and put my hand into His side, I will not believe" (New International Version). In the Upper Room during the First Supper, the Bible says in John 20:27 that Jesus "said to Thomas, 'Put your finger here; see my hands. Reach out your hand and put it into my side. Stop doubting and believe.'" When Thomas did this, "Jesus told him, 'Because you have seen me, you have believed; blessed are those who have not seen and yet have believed'" (John 20:29, New International Version). According to church tradition, Thomas never doubted Jesus again and was martyred by being tormented with red hot plates, speared and burned alive. After Andrew saw Jesus resurrected in the Upper Room, Andrew boldly went out and preached the Gospel. According to tradition, the governor of Greece ordered Andrew crucified because he was converting people to follow Jesus Christ and would not renounce his faith. Andrew, feeling unworthy to be crucified in the same manner as Jesus, requested to be crucified on an X-shaped cross. Instead of being nailed to the cross like Jesus, Andrew was tied with rope. This prolonged his death for two days. Even during this torture, Andrew continued preaching the Gospel to people as they watched his crucifixion. The Bible states in Mark 14:50 that Simon was one of the disciples that deserted Jesus during His arrest. When he saw Jesus alive with his own eyes in the Upper Room, Simon became an evangelist for the message of Jesus Christ and never deserted Him again. Historians tell of the many places that Simon traveled to spread the word about Christ's resurrection and salvation message. He preached in Egypt, Libya, Africa, Mauritania, Britain, Iran, and Syria. According to tradition, Simon was martyred by being cut in half with a saw for believing in Jesus Christ. After the disciples saw Jesus in the Upper Room and were filled with the Holy Spirit, they decided to spread out and preach the Good News. Bartholomew did just that. Historical evidence indicates that Bartholomew went to Egypt, Arabia and India. He transformed into a man of complete surrender to Jesus after seeing Him resurrected with his own eyes. Bartholomew is said to have converted Polymius, the king of Armenia, to a follower of Jesus Christ. This angered the king's brother, Astyages, who ordered Bartholomew's execution. Bartholomew was cut, skinned alive, and beheaded. Two disciples were named James. The older disciple was referred to as James the Elder. After he saw Jesus had risen, James the Elder traveled to Jerusalem and Judea to preach the gospel. James the Elder was a man of extraordinary faith and courage. He was believed to be the first disciple who was martyred for his faith. The Bible describes in Acts 12:1-2 how King Herod had him killed with a sword. It is believed his head was cut off and buried under the altar of present-day Armenian Apostolic Cathedral of St. James in Jerusalem. Two disciples were named James. The younger disciple was referred to as James the Younger. Like many other disciples, James the Younger abandoned Jesus during His trial and crucifixion for fear of being arrested. After he witnessed the resurrection of Jesus, James the Younger preached in Palestine and Egypt. He is believed to be one of the last disciples martyred for his faith. Historical evidence indicates that the Scribes and Pharisees were threatened by his preaching and had him stoned and clubbed in the head until he died. His dead body was cut into pieces. In John 19:25-27, the Bible states that John stayed with Jesus as He was being crucified. He cared for the mother of Jesus, Mary, until she passed away. John wrote the last book of the Bible called Revelation. In Revelation 1:9, he describes how he was exiled to the island of Patmos for preaching the gospel. According to tradition, John was the only one of the disciples not to die a violent death. Instead, he passed away peacefully in Patmos in his old age. The Bible states in Luke 22 that Judas was the disciple that betrayed Jesus. The night that Jesus was arrested, Judas led the Roman soldiers to where Jesus was located and kissed Him on the cheek. That kiss was the signal so that the soldiers would know who to arrest. For helping betray Jesus, Judas was paid 30 pieces of silver. When Judas realized that Jesus truly was the Christ, he was filled with regret. The Bible states in Matthew 27:5 that Judas threw the silver pieces back into the temple and committed suicide by hanging himself. Consequently, Judas was not present at the First Supper. Jude was known also as Thaddeus. Tradition says that he preached in Syria, Iran, Iraq, and Turkey near the Euphrates River. He healed several people and converted many to followers of Jesus Christ. Jude is widely believed to have written the next-to-last book of the Bible. Entitled Jude, it is only 25 verses long but has a very powerful message. Jude was believed to have been martyred for his faith by being beaten with sticks and then shot with arrows until he died. Historical evidence indicates that his body was buried at St. Peter's Basilica in the present-day Vatican City. The Bible states in Matthew 9:9 that Matthew was a tax collector. Back in those days, tax collectors were despised for their unethical practices. God still picked Matthew and changed his heart. After seeing Jesus resurrected, Matthew went out and professed that Christ was real. Matthew was also a gifted writer. He wrote the first book of the New Testament in the Bible. Historical evidence suggests that Matthew ministered in Macedonia, Syria, Iran, and Ethiopia. While in Ethiopia, it is believed that he was beheaded for his faith in Jesus Christ. The Bible describes in Luke 22:54-62 that Peter denied knowing Jesus three times during the trial of Jesus. Peter feared that he also would be arrested. After Peter saw Jesus resurrected at the First Supper and realized that Jesus truly was the risen Savior, Peter never abandoned Him again. According to church history, Peter was given the chance to deny Jesus at the end of his life to avoid being crucified. Historical evidence suggests that Peter boldly refused and requested to be crucified upside down because he did not think himself worthy to be crucified in the same manner as Jesus. The Bible describes in Acts 8:4-8 that Philip went to Samaria (modern day West Bank in Israel) to preach about Jesus Christ. While in Samaria, he performed many miracles and healed the lame. According to most historians, Philip was tortured by having hooks run through his ankles and hung upside. He was crucified for his belief in Jesus Christ. While he was dying, Philip request his body not be wrapped in linen but instead be wrapped in papyrus. The dead body of Jesus Christ was wrapped in linen (Matthew 27:59), and Philip did not think himself worthy enough to be treated in the same manner as Jesus.